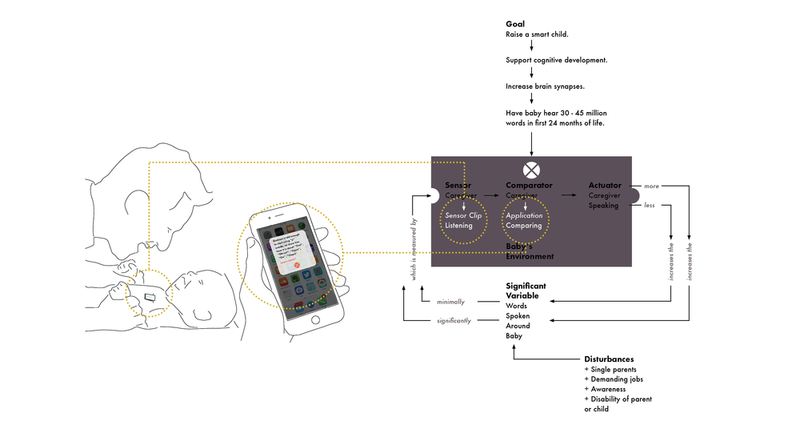 A cognitive development ecosystem leveraging voice interfaces. Brainy Baby is a connected ecosystem designed to assist new parents in the cognitive development of their infant’s brain. Studies have shown that words combined with social interaction act as scaffolding for the child's cognitive development; just by speaking more words, caregivers can make a huge impact that lasts a lifetime. At the center of the ecosystem is a sensor clip which is worn by the child throughout the day and collects words that are spoken. Multiple smart phones can be linked to the sensor through the application, which identifies patterns in the parents speech behaviors and suggests cognitive building interactions. After speaking to six sets of new parents, it became clear that they needed a little help - although they knew about the importance of speaking many words to their infants, it was hard to change their behavior to speak in the presence of human who could not participate in the conversation. Leveraging the power of new voice technologies, I realized I could create a very simple tool to help parent by counting and tracking their words for them. Iterating on a series of form factors, the final solution was inspired by pacifier clips which a child could easily where throughout the day and not interfere with an already challenging array of activities.